I have had to fend more than a few Cottonmouths off with my fishing pole. Good thing my pole is 7 feet long and acts like one heck of a whip. Ever had one jump out of a tree by you? That will make you move the boat in one big hurry! It doesnt matter how good the fishing is. When it's raining cotton mouths, I'm outta there. It seems we need a new blade, about 7 feet long, for cotton mouth training. I envision a rapier-like rod with a cat-o nine tails tip- all steel. Or #9 shot at ten feet. How would you like to meet this evil bugger in camp at night. 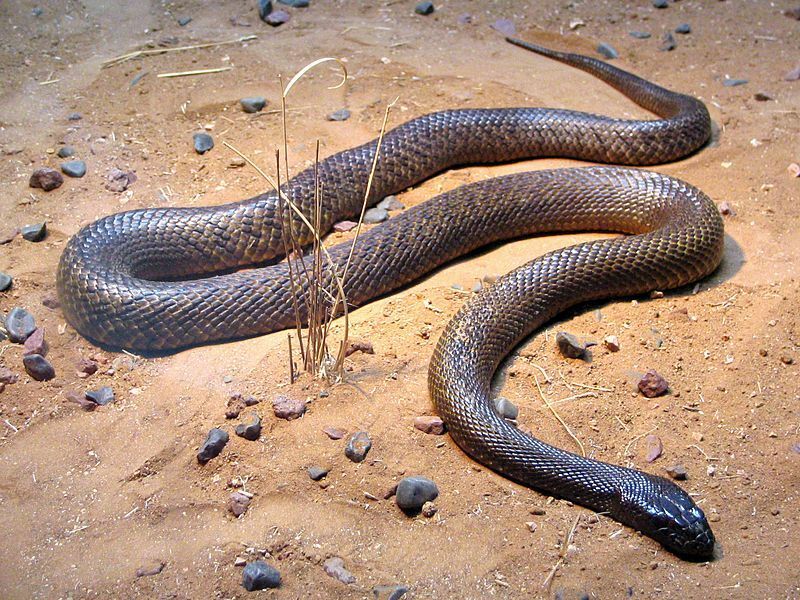 The Inland Taipan or Fierce Snake. That's not anything I want to see in my camp. It would be unloaded on with no mercy! I've never seen one around a camp, mostly I've seen them crossing a track when driving around the bores on a station. I've heard that they strike as fast as Lightning and will bite as many as seven or eight times in a strike. I never want to find out first hand anyways. I slowly stood back up and moved away hoping he wasn't going to strike. He didn't, but I did, I had an old single barrel 12 gauge shot gun behind the seat of the Landcruiser that removed any chance of him ever scaring me again. Ya made a good snake out of a bad snake. You know, I've lived in my place for about 8 years now. 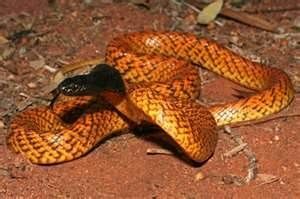 Never seen a snake around the place. I'm out in the yard the other day and see 2 in 5 minutes! First one took off like a bat out of hell! I think I scared him more than anything. Couple minutes later, I'm in the same part of the yard and see another one take off towards the house. I couldn't find that one. I just hope it doesn't find it's way in the house somehow. It's starting to get a bit of a chill at night, so a nice warm house would be pretty inviting to him. I wasn't going to mention it to my wife, but one of them headed right into her flower bed. Figured I'd save her from coming face to face with it while pilling weeds. That would not go so well.